This was originally published in California Prison Focus of Spring 2014., p. 8 and 12. I’m one of the four main SHU reps here at PBSP. I’m writing this brief one on the positive outcomes during our meetings with Sacramento and PBSP offi cials since the end of our last hunger strike. 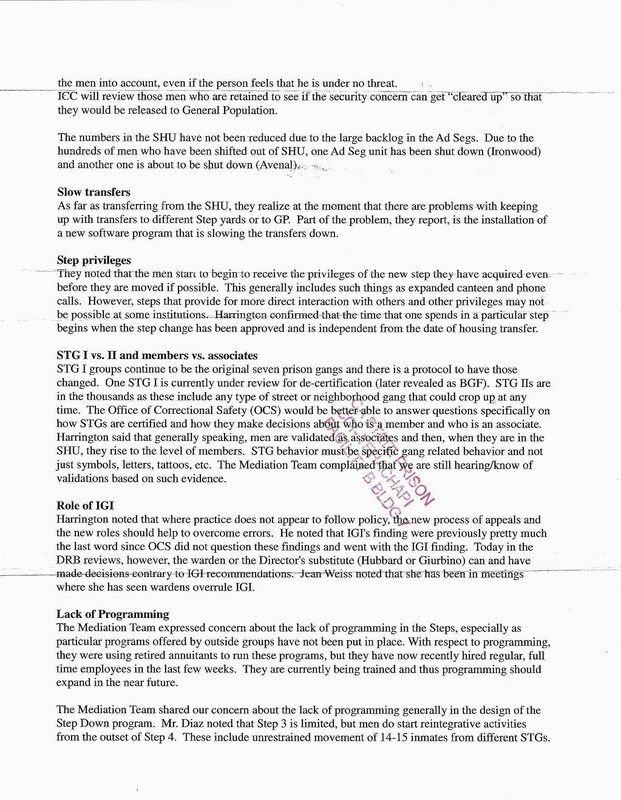 They have been pretty straight forward with us on many issues concerning the possession of personal property and visiting—we have the three hour visits we demanded and Sac officials have completed— and Sac officials have issued the Authorized Personal Property Schedules [APPS] Matrix that allow all SHU male and female prisoners the opportunity to order and possess a lot more personal property items that we demanded and have not been allowed since before 1989. However, at our last meeting with Sac officials, we did raise some issues with the new APPS. We were assured that they are going to tweak it where, for example, they were going to remove the wording “clear-case” ear buds and “clear-case” AC adaptors and adding the necessary electronic accessories to it even though they are automatically implied on the Matrix. And to change the allowable 15.5” flat screen TV to under 16”— Walkenhorsts vendor provides a good quality 15.6 inch RCA flat screen TV—which is good for the aging prison population. These and other additional changes to the Apps are very important to us because, even if the prison wardens approve certain items, the approved vendors will not send them unless they are approved on the Matrix or Sac officials send them a memorandum on it. Sac also stated they will review the Apps once a year to stay current. The following are just some of the many issues raised at this meeting: they are working on obtaining better quality mattresses; they did issue us three white towels and a half blue towel to keep our cell clean; the prison’s bakery had been reopened and is producing better baked goods; the loaner recreational book program will soon be operational again; the state is issuing incoming Ad/Seg prisoners a crank-windup-radio for the first 21 days to use. And if a prisoner stays longer, they can hold on to it as long as another new arrival doesn’t need one. We argued that enough of them should be purchased for all Ad/Seg prisoners for their entire stay in Ad/Seg or allow them to purchase and possess their own crank radio until they finish installing the electrical outlets, cables and shelves. Still, this is a great improvement in Ad/Seg from last Sept. 2013 and 2011 when we were there. As one can see above, I chose to focus on the cooperation we have received from Sac officials and PBSP’s new administration on just the “tangible” items that do effect every SHU prisoner. So the efforts of all prisoners have not been in vain. This is also so other prisoners can address similar issues with their prison’s administrators, for example, extended visits. However, I will take some parting shots at the STG-SDP. Besides the statement we reps put out for the latest joint Senate/Assembly hearings, we strong object to CDCR deleting the word “direct” from the “Direct-Nexus” to gang activity because it now makes it a lot easier for IGI, ISU, and other alphabet bricks that make up the green wall to obtain make-believe statements from their debriefer-informantslaves to continue to bounce any CDCR prisoners between steps 1 through 4 and back. Thus, another main reason we reps pushed so hard for the additional tangible SHU property items. Also, the SDP should only be behavior based, not on how many Journal-Loops one can jump through. All prisoners and outside supporters pushed to get rid of the requirement of signing contracts; now we need to push to get rid of these silly Journals. And, until we see how this plays out, our hopes remain on the present civil suit on solitary confinement and the new bills that are being pushed to put a cap on the amount of time we spend in solitary confinement. That will also do away with the need for any revolving door program like SDP. I personally feel that, right now, on the SDP itself, until it’s changed or eliminated altogether by law or court, it should be up to each individual if they wish to go through the DRB [Departmental Review Board] hearings. I myself will go in April, even though I expect to be placed on step 1, behind all the countless 1030s [informants] in my file. Most here on the short corridor are being placed in 1 or 2. And those that have serious chronic illnesses are being sent to New Folsom, no matter the step they’re placed in. I have no illness so I’ll remain here. And, so far, some are also being placed on steps 3 or 4.
strikes. CDCR has had it on the back burner as a result of the Castillo case. 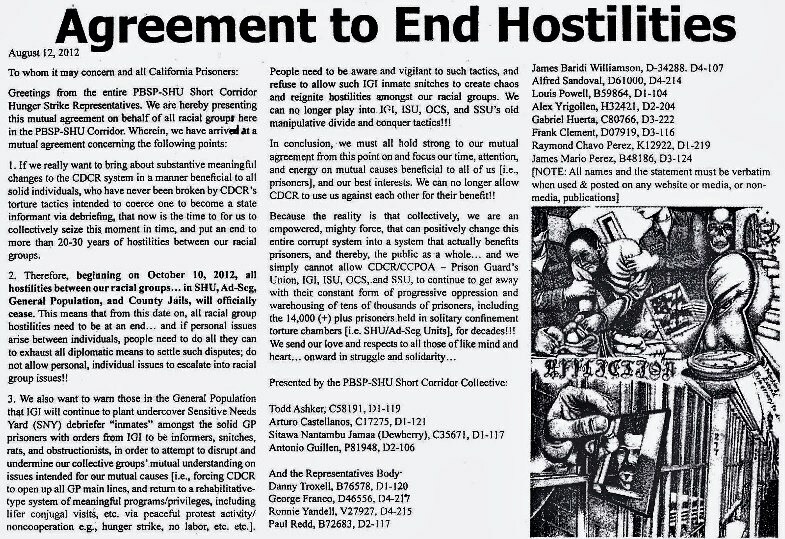 The hunger strikes only forced CDCR to put it on the table a lot sooner than they planned. 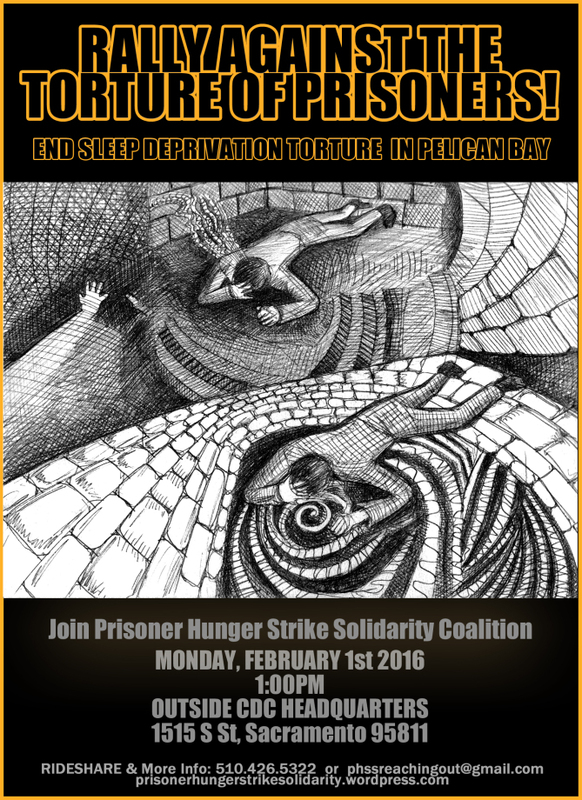 So, no one should try to lay that program’s origins at the hunger strikers’ feet, period! I write this to update you on the two issues I addressed in my last letter of March 3, 2014. First, on the positive cooperation we received from this new administration and second, on the DRB hearings. Regarding the first issue, it has now been over 30 days since we had attended the meeting of February 20th with the administration but yet, to date, they have not issued copies of any of the promised memos to all the SHU buildings, or of what transpired at that meeting. but I’m sure this administration has gotten the point that we will point out the positive—like my last letter—as well as the negative in this letter. On the second issue, the DRB hearings for the short-corridor and others from both C and D facilities, in my last letter I was told the next ones will be held in April. Now they’re saying May of 2014, and will be held every other month. To date they have seen the fi rst 25. In May, they are supposed to see those numbered from 26 through 50, maybe more, because they recently added another 50 to the list numbered from 51 through 100. If any of you believe you are on this list you can contact CCIT Ms. Perez or Ms. Vargas. according to Title 15, section 3376.1. Issues raised at those hearings are fully exhausted at the Directors level. One does not go through the CDCR 602 appeal process on this. All of this vital info is important so the attorneys in our—all SHU prisoners—pending civil suit on solitary confinement. The attorneys can use it to effectively counter any motions for dismissal or summary judgment the U.S. attorney general files later. This info is greatly appreciated and the attorneys assured us that they will keep any materials confi dential. Also, be sure that when you are placed on a step, you stay in touch with the attorneys so they can monitor your progress [i.e., bounced from step to step and back, etc.] 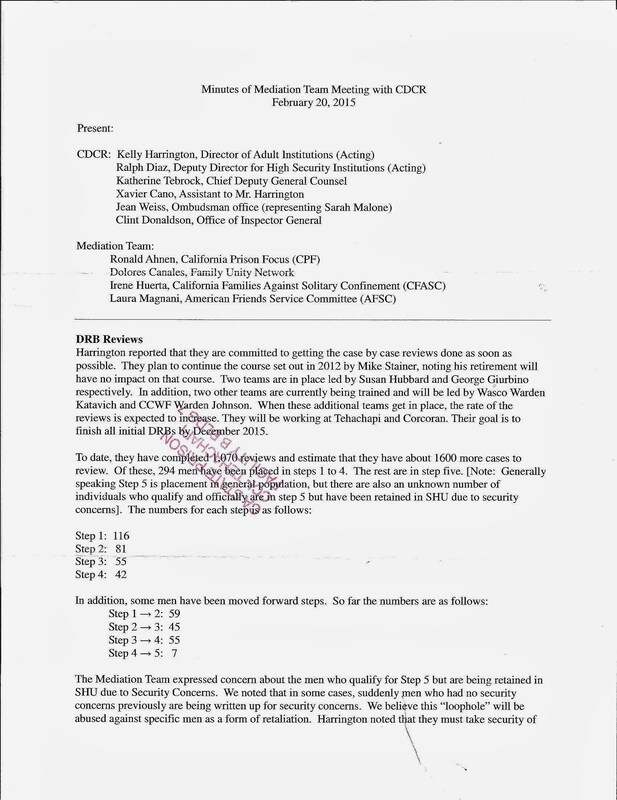 It is also important for the rest of the SHU prison populations across CDCR that you send a general letter to these publications of what transpired at those hearings so they can be informed as to what to expect when they go before the DRB. [Note 1.] While this portion of the document was written in early March, it was not received by your [CPF] editor until early April. [Note 1A] There were no names or addresses of attorneys at the end of this letter, only a note asking outside people to provide said contact information. Those who forwarded the letter to me, up here in Seattle, neglected to provide the contact information for the attorneys. [Note 2.] There were thirteen pages consisting of copies of memos, etc. that were attached to Mr. Castellanos’ letter but are not included here due to space considerations.